Offering you a complete choice of products which include 210 liter drum. 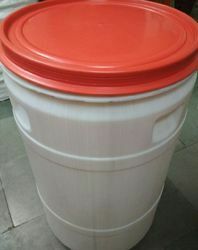 Our Open top drums are straight in shape and useful for packing paste type and semi liquid/ Solid products. It is easier to handle and has rust free metal rings. 1.Open top drums with clamp & Lid. 2.Open top (O/ T) drums for packing. 3. Semi Solid / Viscous /Paste Type / Powder Type Products. 4. Usable in 100 % export Oriented Units. Looking for 210 Liter drum ?